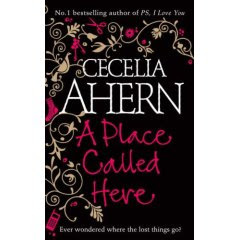 Along with Sophie Kinsella, Cecelia Ahern might be one of my favorite romantic writers. Her books are delicate, romantic and extremely sensible. The first book I've read (PS: I Love You - now a movie) was extremely heart-touching, and it almost made me cry. The next book translated into Romanian was If You Could See Me Now (review in Romanian available here on egirl.ro), and it was charming, a little bit fantastic and a great read. Sadly, those are the only two books translated so far into Romanian, so i decided to order the entire lot from Amazon, to build my summer read list. The first one to arrive was "A place called Here", and i couldn't wait for the Mexican sun in June to start reading it. Like the previous book, a spark of magic keeps the story at the limit of a fairy tale, but the bittersweet tone and the complex psychological problems the characters have to deal with keep it contemporary. Sandy Shortt is an extremely tall girl with black hair (hence her continuous life irony) who is extremely affected by a colleague's mysterious disappearing with no trace when they were 10 years old. Since then Sandy becomes obsessed with missing things, and eventually becomes a Garda, and then a private missing persons investigators. But when she finds herself missing, stuck in an unbelievable place where all the missing things and persons arrive, she should definitely do something to escape.